We are to pursue love as we seek spiritual gifts because love gives life to gifts and love outlives gifts. That’s Paul’s main idea in 1 Corinthians 13, and this study will help you not only to see that in the text but to seek it in your life. The thirteenth chapter of First Corinthians is about having a love strategy. Paul relativizes what we tend to value most (usually our personal distinctives and niches), places love in central view, and summons us to use every power and resource we have for the good of those whom God has placed in our lives. This is the excellent way of love, and it is worthy of our pursuit. If you’re like me, you have either heard or taught love from 1 Corinthians 13. You may even think that you have heard most, if not all of the insights of 1 Corinthians 13. I did. That is, until I read Evan May’s take on the text. Evan brings us into Paul’s thoughts in a clear and engaging way, which is somewhat hard to do. Not only that, he brings clarity to the definition of love which has been hijacked and is now defined as “undogmatic” and “untheological.” However, love is very dogmatic and very theological. In a world where social media has made us, “fall for the delusion that what makes us significant is mainly what causes us to stand out from everyone else, rather than what helps us to serve everyone else,” what we all need now is a little bit of love, properly understood that is. Read this book! In this short, helpful book, Evan shows us why love is so crucially important, and why we must pursue love above everything else. If we don’t have love, we don’t have anything. It doesn’t matter how gifted or “spiritual” we are. Evan repeatedly points us to the path of love and shows why love is one of the most important dynamics of the Christian life. 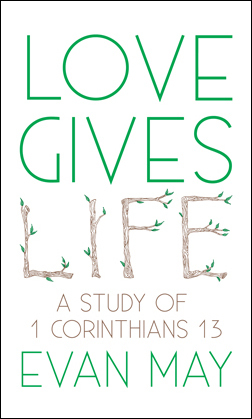 Evan May’s Love Gives Life: A Study of 1 Corinthians 13 is a good example of what Paul says in 1 Cor. 14:26, “Let all things be done for building up.” It is brief, unpretentious, but says what must be said to bring the message of the “love chapter” to the heart of the reader. May has been personally moved by Paul’s words, and he wants to convey to us the same blessing he has found. He has a wonderful gift for simple, conversational writing, with the most natural and appropriate illustrations. He never assaults the reader, but nurtures him gently, so that we find ourselves growing in grace, almost by surprise. No academic trappings here, but May’s understanding of the passage is substantial. I hope that many take the opportunity to learn from this book. and immediate. I recommend this study without qualification, and hope to see more from Evan in the future.